Adidas and Spotify have come up with a novel way to tweak your usual running routine. 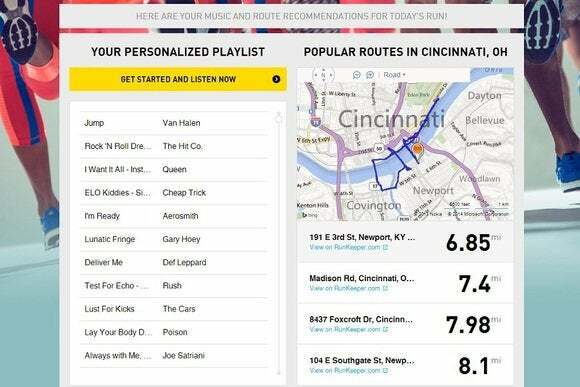 A new website, called Boost Your Run, pairs nearby running routes with an appropriate Spotify playlist based on your musical tastes. When you visit the site, it asks where you are, how long of a run you want, what your favorite running track is, and “how hard you want to go.” You then must sit through a short video ad for Adidas' Energy Boost shoes while the site generates a playlist and suggested routes. The site gives you four possible routes, which you can add to the Runkeeper app for viewing on your phone (or smartwatch). You can also add the Spotify playlist to your collection. As Engadget notes, the “how hard” metric controls the intensity level of the music. One problem with Boost Your Run’s approach: Each suggested run can be anywhere in your town or city, and there's no way to specify a precise address for getting the closest routes. When plugging in a sample location in Los Angeles, for instance, each suggested route was in an entirely different zip code from the one I entered, and would have required long car rides to get to them. Still, as a quick way to stash some potential routes and playlists for later, Boost Your Run seems pretty clever. And now that Spotify supports free, shuffled playlists on smartphones, you don't even need a subscription to take advantage. With some tweaking on Boost Your Run’s location side, it could be even better.